“But which one should I get?”, said senior Matthew Hopkins as he perused the sushi menu at the cafeteria at Marist College on Monday night. Hopkins and his three companions had just arrived at the cafeteria for what hopefully will be one of their last visits. After going through a semester where he neglected his cafeteria swipes, Hopkins is left with the challenge of finishing his final 11 swipes in less than two weeks. “I work two days a week and live on the other side of the campus so it was really hard to get over here and use my swipes,” said the discouraged Hopkins, who swiped his friends in to reduce his swipe amount to 8. 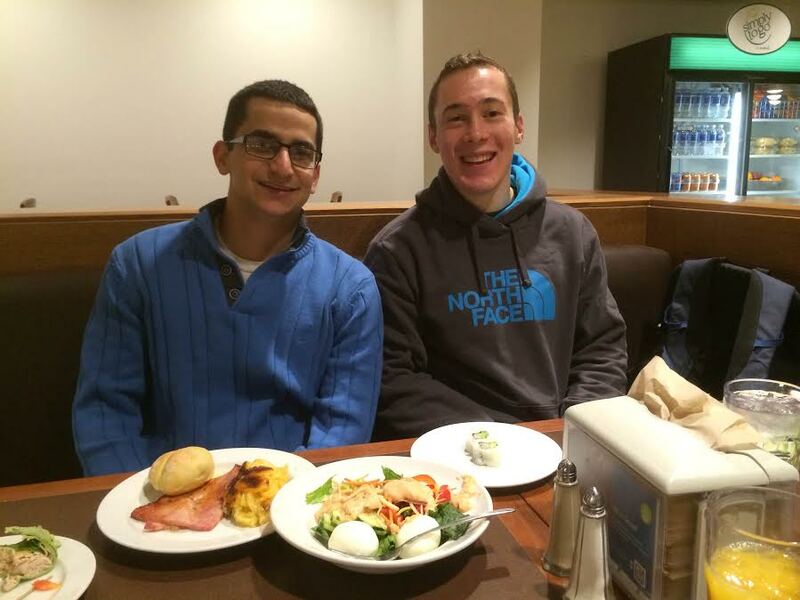 Matthew Hopkins and Justin Hermann about to enjoy their meal. Despite the pressure of taking full advantage of his meal plan, the cheerful atmosphere of the holiday themed decorations in the cafeteria made the group’s eating experience very enjoyable. 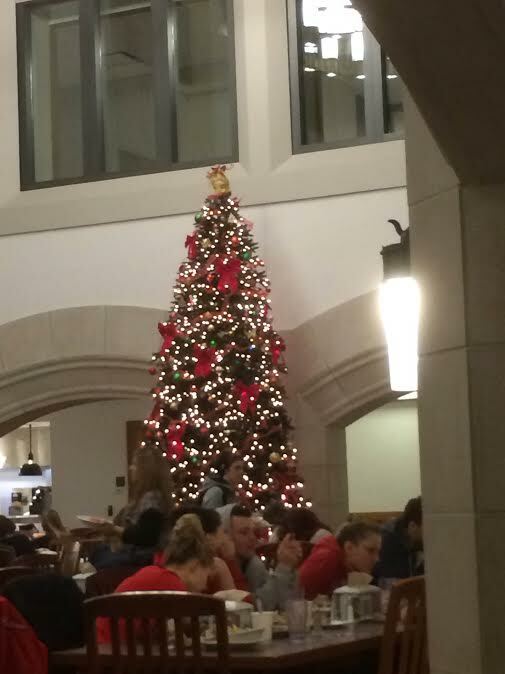 “You think that tree is real?” said Zach Modelski as he motioned to the tree in the middle of the cafeteria that is colorfully lit with Christmas lights. “What tree?” said Tyler Schwarz as he frantically looked around for the thematic tree. “Oh that one? Definitely not.” Schwarz said dismissively. The colorful Christmas tree added a wonderful ambiance to the atmosphere. The four companions enjoyed a mixed, large meal of honey ham, potatoes, salad, wraps, sushi, and sandwiches (a seemingly standard collegiate meal). Group meals like this in cafeteria are hard to do as seniors, they’re much more common among freshmen. Regardless, the four were able to get together for one of their final times to eat in the cafeteria. “As a freshman it was easy to get together and hit the cafeteria as a group since we were always right there. Now it’s harder to get together but my friends always come running when I tell them that I’ll swipe him into the cafeteria.” concluded Hopkins. As the group put away their dishes a man dressed in a shirt and tie began to play Christmas songs on his trombone, closing out a great session at the cafeteria.